What Is Cyclospora, The Parasite That Sickened Kwik Trip Consumers? While numbers are going down, Wisconsin health officials say they're still identifying new cases in an outbreak of cyclospora linked to Del Monte vegetable trays sold at Kwik Trip convenience stores in the Midwest. Reports of the outbreak began late last month. Cyclospora, a parasite that affects the intestines, has infected at least 171 people in Wisconsin so far this year. Of those, 122 people who were interviewed by the state Department of Health Services said they ate from the trays purchased at Kwik Trip. It's a significant increase from last year, when the state saw 23 cases. Recalled vegetable tray sticker. Photo courtesy of the U.S. Food and Drug Administration. .
Kwik Trip removed the trays from stores on June 8 and Del Monte issued a recall the following week for vegetable trays with dip in Illinois, Indiana, Iowa, Michigan, Minnesota and Wisconsin. Ryan Wozniak, from DHS's Bureau of Communicable Diseases, said the department is still on the lookout for new cases. Since it's not a common illness in the state, he provided some information about cyclospora, how it's spread and how it's treated. Where does the parasite come from? A one-celled organism, cyclospora, is found in tropical or subtropical countries, occasionally from which produce is imported to the U.S. The parasite is found in human or primate feces and spreads when people ingest food or water that is contaminated with stool, Wozniak said. Wozniak said the parasite is immature when it's passed in feces. In other words, it's not effective. After days or weeks in an environment at temperatures between 72 to 90 degrees, cyclospora will mature. "Stool that has developed mature and infective cyclospora parasites can then contaminate soil and water that can be spread to fruits and vegetables in the field through direct contact with soil, irrigation with contaminated water or precipitation events that splash contaminated soil onto produce," Wozniak said. Contaminated water can also spread the parasite, he said. Because the parasite attacks the intestines, it causes symptoms such as watery diarrhea, loss of appetite, stomach cramps, bloating, increased gas, nausea and fatigue, Wozniak said. But according to the Mayo Clinic Health System, some infected people won't exhibit signs of infection. 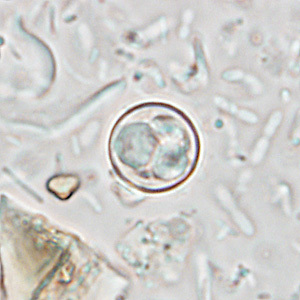 This image of Cyclospora is taken at 1,000 times magnification. Photo courtesy of the Centers for Disease Control and Prevention. .
Of those who do have symptoms, most often they will appear within two to 11 days of eating contaminated food, the hospital reported. Wozniak said being infected typically won't lead to death, although it could. Still, he said this parasite isn't as dangerous as some other food-borne illnesses. The most common treatment is by the antibiotic sold as Bactrim, Septra or Cotrim, which contains trimethoprim and sulfamethoxazole. Wozniak said some people are allergic to sulfonamides, and noted not many other options have proven effective against the parasite. How do you protect yourself from food-borne illnesses? Wozniak said DHS recommends always rinsing or cooking raw fruits and vegetables. "If you can't cook it, peel it or wash it in safe water, do not eat it," he said. Food preparers should always wash hands before prepping food, and wash fruits and vegetables, making sure to scrub those with thicker skins. Washing cutting boards, dishes, utensils and countertops with hot, soapy water also will help prevent the spread of parasites and bacteria. While rinsing helps, Wozniak warned that it doesn't kill the parasites completely, but it does reduce the amount. Wozniak said eating local produce can help prevent people from getting parasites such as cyclospora because the parasite is not regularly found in the U.S. But there is a still a chance people will be exposed to parasites and bacteria that are endemic, he said. Feel Like Kwik Trips Have Exploded In Number? You're Right.